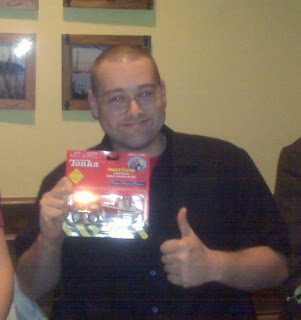 Chris and I were pleasantly surprised this past Wednesday when the auction staff dinner turned into a baby shower in our honor! The people I work for and with are truly amazing! We had a blast and are so, so very appreciative of all their thoughts, gifts and support. Our baby boy is very blessed to have so many people wanting to meet him and love him! Here are a few photos from the nights events... they were taken with my Blackberry so color isn't great, but who cares, you can still see the wonderful time we had and the smiles on our faces!!! Aren't these the most precious socks?!?! They are so tiny and cute!!! Here is a shot of the whole table. 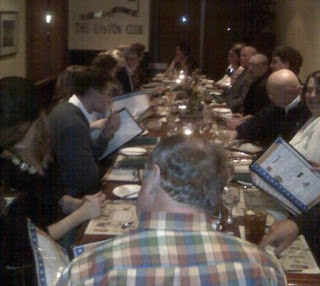 We had a great dinner at the Waterview Grill at the Easton Club. Chris and I both got the Pork Osco Busso with mushroom and asparagus risotto, which was simply amazing! 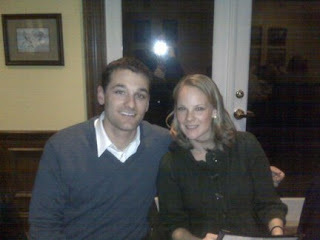 Lacey and Zac, the newlyweds (as of September). They helped organize the whole thing. Lacey is a nurse and is going to be my birth coach, I couldn't ask for a sweeter person to help me out! Lacey got the cake at the shower too, she did a great job picking it out, it was delicious! Yellow cake with a raspberry filling between the 2 layers! Dale Guyette, I believe her and her husband, Gary (my boss) were the masterminds behind it all. 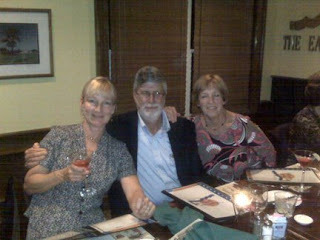 This is Dale with her brother-in-law, John, and her sister, Diane. Unfortunately Dale sat across from us and Gary beside us so I got home and realized I didn't get a picture of the 2 of them! 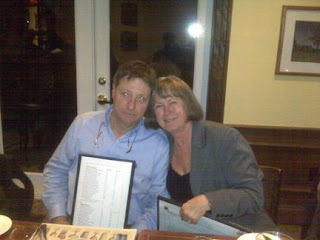 This is the other half of the company, Frank & Vicki Schmidt. Frank, Vicki, Dale and Gary all chipped in and got us our wonderful car seat! 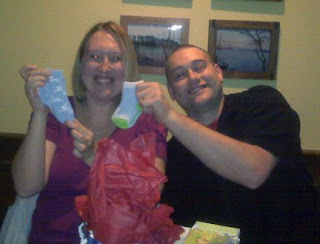 We got many great gifts and are truly thankful for them all! The night was a huge surprise and I even cried... what am I saying, of course I cried!!! They presented the cake and I couldn't help it! It's just such a wonderful feeling to feel so loved and blessed. Many of these people have been waiting for as long as we have for Aidan to join us! I feel so blessed to have such wonderful people in his life, as well as ours. Aidan, I can't wait for you to meet all of these people! They are wonderful and will love you like you are part of their family! You're going to love them all!!! In other news Chris and I purchased Aidan's bedding. We had Babies R Us coupons and I just wanted to get him something, and I wanted the nursery closer to being done... here it is! Fun! I am so happy you had a great time and have so many good people in your life. You have been so patient waiting for Aidan and it is great to see you having such a fun, enjoyable pregnancy. yay surprise shower!! that is sooo fun!! what a great work you have! and the bedding and nursery look so great! yay!! !